Today’s guest picture is a speedy little number as it was taken by our friend Bruce as he whizzed along the Settle to Carlisle railway line at 50 mph this afternoon. We had the same chilly less warm weather here in Langholm and for the second day running, I had the slightly mournful pleasure of admiring our sunlit snow capped hills from our upstairs window…. …rather than being out and about snapping away at the scenery. The day of rest yesterday seemed to have improved the state of my foot so I thought that I should take the hint and spend another more or less motionless day indoors. Part of the impulse to do this was driven by the very icy state of things outside. …with neatly iced box balls. From our back door, I could see the hardly hill cattle finding something to eat on the slopes of Castle Hill. In the garden, our lone brambling made a return but once again, it didn’t come down to the feeder and didn’t stay long. …so I had time to contemplate the ice capped plants nearby from time to time. …and you would never guess that the sun shone all day. When they did come on from the sunny side, they made sure that they got the shadow of the feeder on them so I still couldn’t see them properly. The result was a lot of silhouettes like these. I am going to miss the first producers’ market of the year as I will be away on Saturday so Mike Tinker very kindly came round to get a shopping list of items which he and Alison will purchase on my behalf. These are the sort of friends you need. I only just managed to resist the temptation to go for a walk as it was such a glorious day but luckily I had some Archive Group work to finish and some songs to practise, so I occupied the time quite usefully. Because of the cold and the snow, we didn’t go to Edinburgh to visit Matilda today and this gave Mrs Tootlepedal time to finish another week’s work on the crochet blanket. She thinks that there may be two more weeks to go before the blanket will be finished. Weather permitting (there is snow forecast in England), we are going south tomorrow to visit relatives so there will only be brief phone posts while we are away. The temperature is going to remain low in Langholm so I will fill the feeders up before we go off to catch the train and hope that the birds find somewhere else to eat if these get emptied. Since the queen has asked us all to pull together as a nation*, I am happy to use an English bird for today’s guest picture. Venetia spotted this plump pigeon in her Somerset garden. We got a bit of a shock after a night when we had been woken up by heavy rain pounding on the roof to find the garden looking like this. And it kept snowing and looked as though it might come to something. The birds obviously thought that action was required and the feeder was busy from the start. If you look carefully you can see that three chaffinches are competing for a single perch. Once again, a small flock of starlings perched on the very top of the walnut tree but they didn’t venture down into the garden. Mrs Tootlepedal spotted a robin pecking a fat ball in the sheltered container that she has recently cleaned up. Dropscone dropped in with some scones and news of his first committee meeting as captain of the golf club. Nothing exciting happened at the meeting which is a good thing. While we ate, sipped and chatted, the chaffinches continued to bicker outside and…. …the snow came down heavily from time to time. After Dropscone left, Mrs Tootlepedal went off to help out at the Buccleuch Centre coffee shop over lunchtime and I walked up to the new Archive Centre base in the newspaper offices on the High Street and did some work. The snow had stopped falling by this time so I was able to stop and enjoy the scenery on my way. My work in the newspaper offices consisted of photographing twenty nine articles from back numbers of the Eskdale and Liddesdale Advertiser which are held in bound volumes there. A correspondent has been going through the newspaper index on our website and he has found many references to his family. He had found them been being born and dying, playing cricket, attending school concerts and school inspection days, doing a lot of fishing and on one occasion being found guilty of malicious damage by foolishly pinging a pony with a catapult. It was a full and varied selection which made my task more interesting. Mrs Tootlepedal was a bit shocked by how much work we had been asked to do but for me it was a pleasure, as requests like this mean that we are not doing our archiving work in vain. …and there was no danger of slipping as I went. Mrs Tootlepedal got home from a very busy session of waiting at table in the coffee shop and almost immediately rushed off to catch the bus to Carlisle where she had arranged to go to the pictures with two friends from the Carlisle choir. I had hoped to drive her down as time was tight but the car had not come back from the garage. While she was gone, I processed the 29 newspaper images and emailed them off to my correspondent. Just as I was finishing, Mike Tinker came round and very kindly offered to drive me up to the garage so that I could collect our car. It had passed its test with a couple of minor grumbles about this and that so I drove it home. And then, because the day seemed quite promising by this time and I had been sitting around long enough, I went for a little drive out of the town on the well cleared main road to have a look around. …but once again, hills seemed to be attracting their own personalised clouds. I drove back through the town and out again on the minor road towards Bentpath. It was by no means clear of snow, ice and slush so I didn’t go far but parked the car at the quarry and had a look around. I thought that I might get a better views if I scrambled up a small hill beside the road and as I had had the forethought to bring my wellies and walking poles, I did just that. This was the view up the valley. Things looked promising as I neared my mini summit and I bustled along to get there before the hint of sunshine disappeared. I waited for a while and soon Whita was bathed in warm pink. To the west, there was a dramatic cloudscape. …on my way, I saw some interesting pitted track marks in the snow and wondered for a moment if a gang of tiny animals had been about. Looking up though, I found the cause was more prosaic, just melting snow from the power line. It was back to freezing by the time that I got in and I was pleased to have a snack and warm up. The bus brought Mrs Tootlepedal safely back from Carlisle. She had enjoyed the film, Collete and had even had time to buy a prawn sandwich to eat on the bus home so she had had a good outing. Although there were a lot of birds about, I didn’t have much time to look at them and this rather vague chaffinch is the best that I have for flying bird of the day. *Note: I don’t think that the English politicians have been paying attention to the Queen’s request as when it came to considering a motion in Parliament this evening asking the government to pay some attention to the needs and wishes of Scotland and Wales while conducting their brexit business, the Conservatives voted against it en bloc and the Labour party abstained. I have delved into my archives to find today’s guest picture sent by my Somerset correspondent, Venetia last October. It shows a footpath that is not totally welcoming. We woke to an altered view from our upstairs window. The snow hadn’t got down as far as the town though and I was able to walk to our corner shop on surprisingly ice free roads. …although there are several more coats to go on before it will be ready for painting. When Sandy left, I did the crossword and kept an eye for action outside the kitchen window. …which doesn’t usually sit quietly for long enough for me to take a picture. In spite of the snow, it was a reasonably pleasant day with occasional bursts of sunshine and although the temperature was only 3°C and it had rained overnight in the town, we were mysteriously free from ice so I went for a walk half way up a hill. I went up the Kirk Wynd and onto Whita, stopping before I came to any serious snow. The sun had been out when I started but sadly clouds had intervened and it was a pretty grey day. Even on a grey day though, there is usually something to cheer a walker up and there was a good show of lichen on a wall…. …and the view up the Ewes valley always lifts the heart whatever the weather. I was on the very edge of the snow line as I walked along the contour of the hill towards the Newcastleton road but the going was very good and I had sensibly taken my walking poles with me so I enjoyed myself. …and a wintry view through the pines. Looking back up the hill, I was glad that I hadn’t been tempted to climb up to the monument as it looked decidedly chilly up there. I followed the road down to the A7 and walked along to the Kilngreen past this fine display of holly berries. …and I was very happy to see Mr Grumpy on the bank of the Ewes Water. I haven’t seen him for some time and was getting worried about his health. There was more agreement about the way to go among the mallards today. Looking back towards the Sawmill Brig and Castle Hill, it was hard to imagine that I had been walking in snow not long before. …being pleased to see a greenfinch and by accident I took a picture which shows how small our garden bird visitors are in the great scheme of things. Whatever it is that is causing me to have discomfort when walking at the moment hadn’t been made worse by my walk so I decided that the roads were probably ice free enough to risk a few miles on the slow bike to see if that sort of exercise would help. …which was a bonus and I pedalled very gently for seven miles without meeting any icy patches or making my leg worse so I was very happy. I will try a longer ride next time when the weather permits. In the evening, the ever busy Mrs Tootlepedal laid down her crochet hook and went off to act as front of house for a screening of the Queen of Spades at the Buccleuch Centre and stayed to see the opera. As Tchaikovsky is not my favourite composer, I stayed at home and did a little more work on learning the Carlisle Choir songs. Like putting gesso on a rocking horse, this is a slow business. A chaffinch is the flying bird of the day as the visit of the sparrow hawk didn’t keep the birds away from the feeder for long. A toddle, a pedal and two tootles! Today’s guest picture from son Tony in East Wemyss goes to prove that you can find grumpy herons all over the place. It was a beautiful morning with a delicate sunrise but it was chilly enough at 4°C after breakfast to keep me from getting my bike out. Instead, I walked up to the town where I did a bit of archive group business. I asked Nancy, who was mining data in our new premises, for a suggestion for an interesting walk but she was unable to come up with one that hadn’t already figured in the blog. Scratching my head, I went out into to the street and bumped into Mike Tinker. 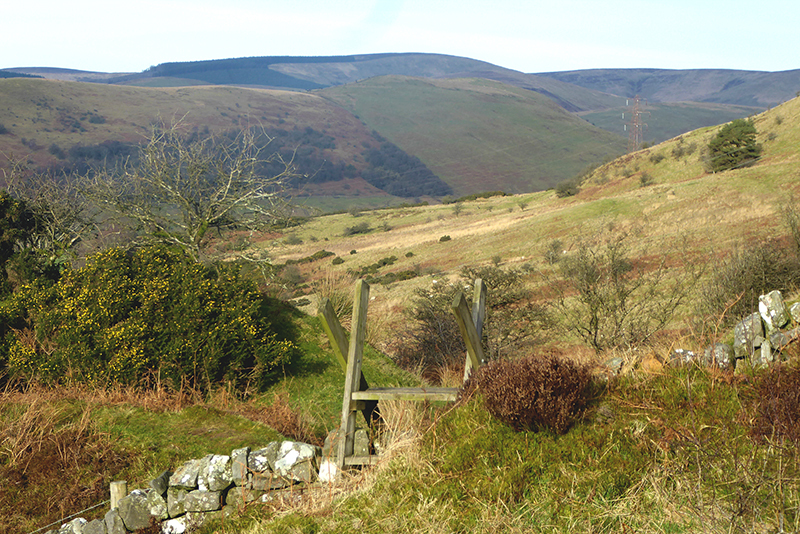 He is a stalwart of the Langholm Walks group and suggested that I try Walk 5. As this involves walking up steep rough ground and I hadn’t got either walking boots or my walking poles with me, Nancy and I hadn’t considered this. However, nothing ventured, nothing gained so I resolved to take up Mike’s suggestion, trust to the ground being firm and the boggy bits few and far between and hope that I didn’t fall over on a slippery bit. It starts with a stroll along the river out of the town and this led me past one of favourite bits of lichen which can be found on a fence just on the very edge of Langholm. It is a grey and black lichen and so a black and white shot seemed like a good idea. I crossed Skippers Bridge without taking a photograph and was soon walking up the track towards the hill. I could see the mast on the top of Warbla (275m) in the distance and it seemed to be a good day to be up beside it so I pressed on. My hopes about the dry ground and lack of boggy bits were fully realised and though the hill is quite steep in places, I was able to stop and admire the view from time to time and get my breath back. There was even some more lichen on a rock to detain me. It wasn’t too long before I was able to look back down on the town, snugly tucked into its nest at the bottom of the hills. …and to look ahead to my immediate target. …which I shared with a man and a dog who had reached the trig point from the opposite side of the hill. We agreed that a better place to be on such a fine day would be hard to find. From the summit, I could look across the valley and stretching the zoom on the Lumix to its full extent, I could just make out the stile over the wall on Whita that I had crossed on a walk almost a week ago on another fine day. It was about a mile away. …and the track to the town was at its best. However, without my walking poles, I had to keep my head well down as I went along since there were plenty of opportunities to slip and slide on wet grass or slippery stones and I took no more views and only got the camera out to note this tree growing out of the top of a wall in a rather unlikely fashion…. …and got home safely with dry feet and no unexpected encounters between my backside and mother earth. By coincidence, I met Nancy just as I got back. She had been dropping off some of the results of her data mining for me to enter into the Archive Group’s newspaper database. I’ll have to hope for some wet and windy weather which makes entering data a sensible thing to be doing. I made some vegetable soup for lunch and found some bright eyed birds at the garden feeder. After lunch, the temperature had risen enough to make cycling a possibility so I got into my cycling gear, got my bike and set off. In an exciting fashion I rode round the block and was home again in about three minutes. It had started to rain heavily much to my surprise and annoyance. There had been no sign of this sort of thing while I was out walking. However, I kept my cycling gear on and after only a few minutes, the rain had disappeared as suddenly as it had come, and I set off again. It was a lovely day for a pedal! The days are still short though and I only had time for 23 miles before it began to get gloomy. Because I was pushed for time, I took just that one picture on my ride which was of the scenically dull ‘up and down the road’ variety. It was enjoyable pedalling though and my legs only reminded me of my morning walk once or twice. I got home in time for a cup of tea and some Garibaldi biscuits which we had bought in Carlisle yesterday. While eating the biscuits, I was able to reflect that too much of my life has been wasted not eating Garibaldi biscuits, an omission which I will try to correct in the years to come. Mrs Tootlepedal had been out doing some useful gardening while I had been pedalling so we were both quite satisfied with our afternoon’s work. After the tea and biscuits it was time for my flute pupil Luke to come and we played a sonata by Godfrey Finger and worked on a bit of one by J J Quantz. After Luke went, there was time to enjoy a second helping of Mrs Tootlepedal’s tasty puy lentil, leek and feta bake for tea before I went off to play trios with Mike and Isabel. Here we played Mozart, Boismortier and Schickhardt so that rounded off a very good all round sort of day. I even found a satisfactory flying bird of the day. Today’s guest picture comes from my sister Mary. She has been suffering from a bad cold but has recovered enough to walk up to Kenwood House to have a coffee and a mince pie in the cafe. She found a very fine day for her excursion. We had another calm and sunny day here today but we paid the price for a clear night by having a frosty morning. The chill encouraged a few birds to come to the feeder and it persuaded me to go for a walk rather than a cycle ride after coffee as the the thermometer was still showing a meagre 1°C at 11 o’clock. This may have been too cold for pedalling but it was ideal for walking as the ground was nicely firm under foot when I got on to the hill. I walked up the track to Whita from the town. I was surprised to find a dandelion out as well as a garden escape on my way up the Kirk Wynd but the blooming gorse on the hill was no surprise as it is out all over the place. There was no lichen looking cheerful on the wall at the top of the track but the moss was remarkable. I don’t think that I have ever noticed it looking quite like this before. The view up the Ewes Valley did not disappoint and the weather seemed set fair for a stroll. When I got to the open hill, I didn’t continue straight up to the monument but turned right along the face of the hill following the old quarry track along the contours. Looking across the town, I could see the Craig Wind Farm turbines rotating very lazily in the light breeze. It was a pleasure to be out on such a day. I had a look at the trig points on the top of Warbla and Timpen. In these days of digital mapping, they serve no useful purpose but I am glad that they haven’t been taken away as they provide a punctuation mark at the summits. Both of them were dwarfed, the one on Warbla by the communications mast beside it, and the one on Timpen by a blade of a turbine nearly a mile away behind it. Three sheep pondered on my activities. When I reached the wall at the end of the track, I paused to look over the town. Below me, a field lined with tall trees vividly showed the difference between sunshine and shade. I was glad to be in the sun. There are many photo opportunities round Langholm and this stile over the wall at the quarry is one of the most popular and I hardly ever cross it without stopping to take a picture. Today, this turned out to be slightly embarrassing for a gentlemen who was having a pee behind the gorse bush and hadn’t seen me coming. He soon drifted out of shot though, muttering as he went. …passing an elegantly decaying tree trunk…. …to Skippers Bridge. It was far too good a day to miss the photo opportunity there. I walked back along the river without seeing anything exciting enough to make me stop again and got home after four miles just in time for lunch. I was reflecting as I got back to town that I had just crossed moor and mountain and passed field and fountain and as it is Epiphany, I thought that perhaps I ought to bring Mrs Tootlepedal some rich gifts. I stopped at our corner shop and purchased milk and honey. These would have been a pleasant surprise for her if I hadn’t met her cycling home from an errand just outside the shop. She came in with me. Still, she appreciated the thought. Over lunch, I looked out of the window and saw some sparrows. The males have rich colours on their backs which show up well in sunshine. Once again, there were not many birds about so I let my lens stray towards the sedums round the feeder. After lunch, I had an appointment with the speech therapist in Dumfries, 35 miles away but once again, thanks to the magic of the internet, I was able to see and speak to her online which saved me a lengthy drive and a lot of time. It is a very efficient system which has worked perfectly both times we have used it. As a result of this week’s consultation, I will be humming down a straw into a glass of water for the next seven weeks. She assures me that it will work wonders. Later in the afternoon, I settled down to putting a week of the newspaper index into the Archive Group’s database and finished putting the choir songs onto the computer. This took longer than I expected and when I finally finished, it was time to cook some corned beef hash for my tea. I have decided this year to keep a record of my walks as well as my cycle rides, partly to stop feeling that I should be cycling even when the conditions are not suitable and partly out of interest to see how far I walk. I am only counting actual expeditions like today’s, not the ordinary pottering about house and garden. As a result, I find that I have walked or cycled every day in 2019 so far, cycling 77 miles and walking 20. That seems like quite a good balance. I did find a flying bird of the day today as a chaffinch, some sunshine and a camera in hand all appeared at the same time for once.